Senior Trent Davies carried the load for the Buckeye Valley football team, scoring two touchdowns to lead the Barons to a 17-9 non-league win over Mount Vernon Friday night in Delaware. Davies carried the ball 43 times for 185 yards to lead the way, including a work-horse load of 30 carries in the second half alone. Davies carried 12 times on BV’s 13-play scoring drive in the third quarter, including a 1-yard touchdown run. Felipe Scharff’s extra point gave the Barons (2-1) their first lead at 10-9 with 4:24 left in the third quarter. After a three and out by MV, Davies carried it 10 more times on an 11-play, 45-yard drive. He capped it with a 5-yard touchdown run to push the lead to 17-9 with 9:36 left in the game after picking up the necessary inches on a 4th-and-inches from just outside the 5 on the previous play. BV has bounced back after its heartbreaking loss to Hayes in the opening week. Stephens said his team didn’t recover until the following Wednesday. MV took the lead on its first drive, going 79 yards on 11 plays to set up a Sam Stanley 23-yard field goal for a 3-0 lead with 6:01 left in the first. Logan Tate caught a 19-yard pass from Jaxon Gregory and Kaden Daniels followed with a 26-yard catch and run on the next play to set up the field goal. Tate won a jump ball and went the remaining 30 yards untouched to finish off a 44-yard touchdown catch from Gregory to give the Yellow Jackets (1-2) a 9-0 lead with 11:46 left in the second quarter. BV struggled offensively for much of the first half. But, Grant Owens, who completed just one of his first seven passes for minus-3 yards, got hot just before halftime. He completed six straight passes to move BV 70 yards down to the MV 13. A fumbled snap stalled the drive and Scharff kicked a 28-yard field goal with 2 seconds left in the half to get the Barons on the board. 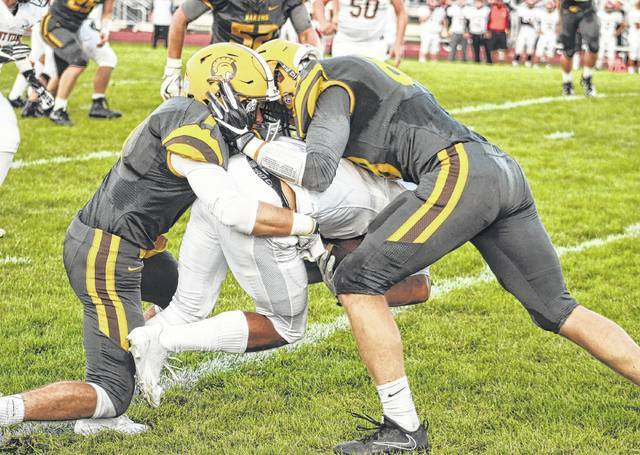 Next up, BV opens MOAC play at home against River Valley Friday at 7 p.m.
Buckeye Valley’s Landon Alexander, left, and Matthew Pentacost tackle Mount Vernon’s Kaden Daniels in the first half of Friday’s non-league showdown in Delaware.